After the huge success of UNSEEN UNDERGROUND PUB FEST, UNSEEN UNDERGROUND organised UNSEEN UNDERGROUND RAGNAROK and here I am sharing the detailed review and few pics of that awesome gig. Unseen Underground is a non profitable organization working towards the welfare of Indian Bands and promotes good music. Organizing shows to give platform for the upcoming bands that really deserve to display their talents in Unseen Underground’s arena. Chennai people welcomed the New Year with a new zest. This time the city had seen something unusual and new. Unseen Underground in association with Fa Men Xtreme had created a history in Chennai by organizing the first ever whole night live rock show, Ragnarok ‘09, at the New Year’s Eve on the 31st of December, 2009 at Geoffrey’s Pub. The show featured 7 bands from across the country. The Rock fans of Chennai had a splendid time throughout the show and some new listeners’ felt the vibrations on the various genres of rock music. As Chennai people were used to electronic music all these years in this season in all the pubs and resorts, Unseen Underground Ragnarok was a unique show that made its fan-base confess that it was the best way to start a new year with pure music and live performances. The crowd was huge. The Bands from other cities too looked forward to this show as there was not one full night live band performance happening anywhere across the country on the 31st of December. And this was the key for the success of Unseen Underground Ragnarok. The idea was new and unique; no wonder it was accepted by hundreds of people, from Chennai and its neighboring cities, who came all the way to witness the finest bands from across the country, enticing them with 6 hours of unadulterated rock and metal music. After a long wait Crypted, a Chennai based progressive death metal band started the show with great fervor. Their music triggered the youngsters to come forward and bang their heads to their powerful riffs and vocals. Soon everybody got mesmerized by their music and started moshing. Next up was a progressive metal band, Purple Blood all the way from Trivandrum to rock the people of Chennai. This young band left the crowd awestruck with their brilliant showmanship. Rampazze, a Rock N Roll and Hard Rock band based in Delhi was not new to the crowd of Chennai. When they took the stage next, the long awaiting fans of this band got much more than what they expected this time. Age no bar, everyone came and joined their journey to old school and rock and roll music. Their music was produced by using some of the best Indian made guitars of HMI. It was amazing to see that their original songs were familiar to most of the crowd, who started to sing along with the band. After this rock and roll journey Abandoned Agony, a technical brutal death metal band from Bangalore took the stage to create a thunder with their original songs. This band has made a strong fan base after their first show in Unseen Underground Pub Fest V. The place was in fire and got packed with lot of people, much more than what the organizers had predicted. The clock struck 12 while they were playing and everyone started greeting each other, including the band. A great beginning to a New Year filled with lots of hope. 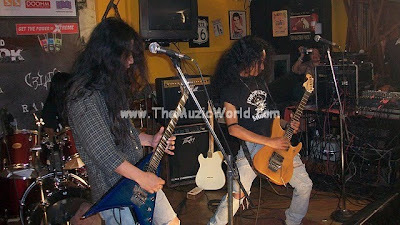 Right after that, the stage was taken by Atmosfear a death metal band from Mumbai. In spite of their first gig in the city they had an excellent crowd support. With their performance, they left the crowd baffled. Chennai’s own Blind Image, a Contemporary metal band came next on stage to ensnare their fans with the songs from their new album “More Than Human”. The scene was just inexpressible. The fans of the band lost themselves to their music in the early hours of 2010. Everyone seemed to be happy about such a commencement to a New Year with their desired music floating in the air. Of course it was something new to the Chennai crowd present in the show. But this was no end. T-Man of Nova Sanctum Fame from Eastern India took stage with his bass guitar jamming session. Addy from Armour of God joined him on stage. Time was a hindrance as there was one more band in the queue. But the crowd wanted more with no sign of winding up. Then, Bangalore based band Kaashmora delivered their best even though time was a constraint for them. The mass was unwilling to leave but it had to end. The show came to a halt with a message of prosperity and inspiration for all; to look forward to 2010; for 365 days of exhilaration and nonstop metal mayhem. We are sure that Unseen Underground has lots more to deliver this year after the success of Ragnarok 09. Fingers crossed! You can check the more pics of this concert from the link given below.